Before I got into all this, I never gave insulation much thoughtwhat's to know? Just add hundreds of pounds of heavy padding type stuff and you've got insulation, right? Wrong! This is the 21st century and today's modern materials put to shame the faux insulation of yester-year. Hey, this is the space-age, remember? OK, maybe we don't have flying cars like I was expecting about this time, but Dynamat Xtreme is a close runner up.Why Xtreme? It's supersticky, easy to mount, lightweight, it's good at dampening vibration (Xtremely so) and it has a neat aluminum barrier on one side to ward off heat, something we Jensen Healey owners are all too familiar with. I've had my Jensen Healey apart for some time now and it's really quite amazing how lightweight and tinny the whole thing is without the upholstery & seats inside. I've also noticed that my tolerance to constant, drumming, annoying sound is somewhat diminished compared to when I was a bit younger and stupider. 16 years of driving the same car everyday can teach a person a lot and I made up my mind some time ago that the next Jensen resto would get the "full treatment". And so this month we delve into Dynamat. This company makes a full line of sound deadening products that I think are pretty cool, including stuff to quite down your noisy computer. Even a spray deal for blasting under the wings! One of their top-of-the-line products is Dynamat Xtreme as it does much for little weight. The 36 square foot kit, enough to do about 80% of the interior, in 19 pounds, which is light considering what you get. The cost is not so light. Looking on the internet, I found prices ranging from $152 to $318 for the same thing! I found one low-ball price at www.car-audio-discount.com which seemed like a hole-in-thewall place, but they shipped promptly and delivered as advertised. Expensive, but for me I'm thinking worth the money. I regularly ran my old JH up to 80 mph everyday on our local Toll Road and at that kind of speed the Jensen Healey is just as noisy as can be and needs all the help it can get. Installation couldn't be easier- cut to size with sissors, peel off backing and stick. It has a killer glue on the back that's never going to fall off. The only involved part is removing all your interior items in the first place. Needless to say, this job is another ideal one to do during a complete tear-down and respray job. Dynamat's web site (dynamat. com) is quite informative, I highly recommend it. Here's some important highlights from the web site: Dynamat is a thin, flexible, easyto- cut and mold sheet that actually stops noise-causing resonance and vibration, by using visco-elastic qualities that promote vibro-acoustic energy conversion. In short, Dynamat turns noise into silent energy. Q: How much Dynamat do I need to use to be effective? A:You can apply Dynamat in patches (25-50% area coverage) to keep a specific panel from resonating or you can apply it over an entire area (such as the floor, doors, or trunk) to create a sound barrier and thermal insulator. Q: How much will Dynamat quiet my car? A: Even a small amount of Dynamat can have a profound effect on noise reduction. In a typical application, applying Dynamat to the doors of your vehicle can reduce road noise upto 3-6dB! This is a huge reduction in road noise. Complete coverage for an average vehicle can reduce road noise 9, 12 even as much as 18dB! Q: How does Dynamat stop road noise? A: As a car operates, it generates noise. This noise is caused by the transference of energy (vibration) from the internal components and from the road to the chassis of the vehicle. The chassis (doors, floors, roof etc.) transforms this vibration into audible noise. Dynamat transforms the energy (vibration) into silent energy. Q: There are four grades of Dynamat. Which one should I use? A: Dynamat Original is our entrylevel damping material and offers the best compromise between damping efficiency and cost. It is recommended for floors, doors, side panels and the floor of the trunk. For best installation and performance, use a heat gun during installation. Dynamat Original is not recommended for locations requiring upside down installation (such as car roofs). For those locations, use either Dynamat Xtreme, Dynashield or Dynaplate. Dynamat Xtreme is our best performing material for controlling vibration. Dynamat Xtreme damps four times better than Dynamat Original and weighs at least 50% less. Dynamat Xtreme's aluminum constraining top layer also makes it well suited for situations where heat is a problem, such as on the floor and firewall near an exhaust or header. Dynamat Xtreme is recommended anywhere Dynamat can be applied. It requires no heat for installation, making it a good choice for home mechanics. Q: My floor board gets hot during long drives. Is there anything I can do? A: Heat coming from a hot exhaust or headers is a common problem. Fortunately, Dynamic Control has a solution. 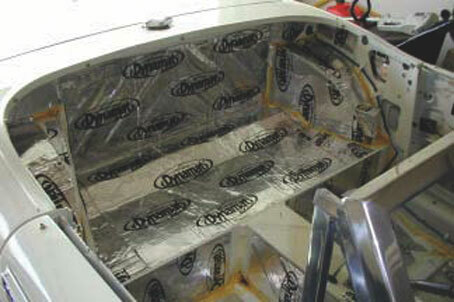 First apply Dynamat Xtreme to the floor and firewall, then install Extremeliner, both underneath the floor's carpet.